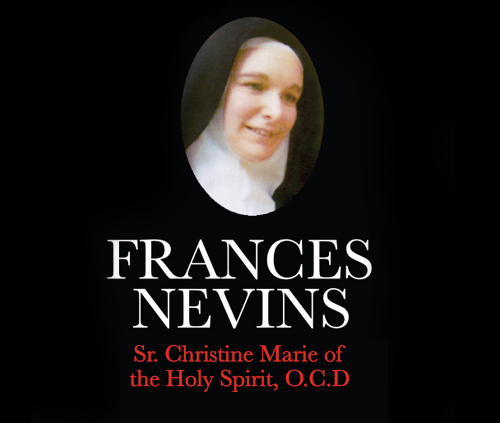 Frances Nevins | Sister France Nevins Carmelite | Sister Christine Marie of the Holy Spirit, O.C.D. | www.FrancesNevins.com - One Condemned Man | Two Miracles? One Condemened Man | Two Miracles? Sister Christine of the Holy Spirit followed the flame of God’s love beyond the cloister over fields and mountains, behind prison walls. My name is Jack H. Potts. I am on death row now for nearly 25 years. I was baptized & confirmed in 1977 on death row by Bishop Raymond Lessard, Savannah Diocese and Fr. Kulwicki who was our prison chaplain. Since 1977 I have had the opportunity given to me to help many many other men be baptized & confirmed. It was not me who takes credit at all, it is the Jesus in me. I am but a sinner saved by the Graces of God. Saved by Our Lord Jesus’ death and resurrection. And helped and saved by Our Lady who helped Jesus Her Son, She was at the foot of His Cross on Calvary so she knows great suffering. My pitiful bit of pain and suffering is nothing compared to what Jesus and Mary suffered. There is no comparison. Sr. Christine was praying constantly for me all through these years and at the time I did not know of her holy prayers but I was reaping the benefits and Thanks be to God for Sr. Christine. My days now are filled with prayers and Sr. Christine now is closer to me and more available than ever before. Many many prayers have been answered through Sr. Christine. Each day I get up at 5am, Divine Office, Scripture, Rosary, and meditation on my Readings. I am but a sinner saved by the Graces of God. Saved by Our Lord Jesus’ death and resurrection. And each time I pray, whether it be at Angelus or Divine Mercy at 3pm each day, or Evening Prayer, Divine Office or Night Prayer, Sr. Christine is close and I ask her to pray with me and for me… I often ask her advice and think to myself- “Now what would Sr. Christine do in this situation or prayer request?” All those years Sr. was praying for me have come to light, and now its been Life Row instead of death row for so many years. Little did I know that one day I would be her brother in Carmel, She, my Sister in Carmel but God in His mysterious way has a way of letting things simply to fall in place. I began my stay on Life Row in 1974... All the men who were with me (13 in all) in 1974 are now dead, freed to society or in regular prison. There are now 121 men on Life Row. I am still working with more and more, Thanks be to God, trying to lead them to Our Father. The Father, The Son and The Holy Spirit. Our Lady Mary Most Holy gently takes each man and guides him to Jesus just as ‘She’ did me … And Yes!! Sr. Christine helps me, now ever more – for I call on her to help me daily with the Converts. I have my morning talks with her in prayer, morning, noon & night. Most recently I had asked her to help my dear mother. And my mother had a tumor, brain tumor so large that it filled the entire side of her head inside… I had asked Sr. Christine to pray that my mother not have pain… To ease her pain and for many many days before my mother’s death, the doctors told my family, “If you want a miracle, if you are looking for a miracle, here it is, your mother has this large tumor, but no pain at all, and that’s how she went to the Lord, simply went to sleep and did not hurt. Praise be Jesus Christ. So yes!! Again I had asked a special prayer and Sr. Christine provided… How good and Holy my Sister in Carmel has been, and still is…as I write. Jack Potts remained on Death Row under the threat of a final death sentence. Interestingly, he became a Third Order Carmelite before his death of liver cancer on December 11, 2006. Jack also credits Sr. Christine’s prayerful intercession for sparing his mother the pain expected to accompany her death from a brain tumor. Catholic publications spread Jack’s story far and wide. His conversion was particularly well known in Ireland, both north and south. Until his death, hatred still lingered against him. The internet reported: “ I, for one, am glad he’s dead”; “justice was carried out without the help of the court system. He won’t bother anyone else”. Sr. Christine predicted that many people will not see or know the new man because they have already closed the door to him. “ He will be a man of sorrows till the day he dies”.